Both a learning platform and a pedagogical experiment, Urban School Ruhr is built upon the foundational belief that experts and amateurs can, together, build a space of critical exchange and knowledge transfer. USR prioritises exchange and dialogue that is not necessarily attached to specific outcomes, results or interventions in built reality, instead understanding conversation as the first step to co-producing cities. 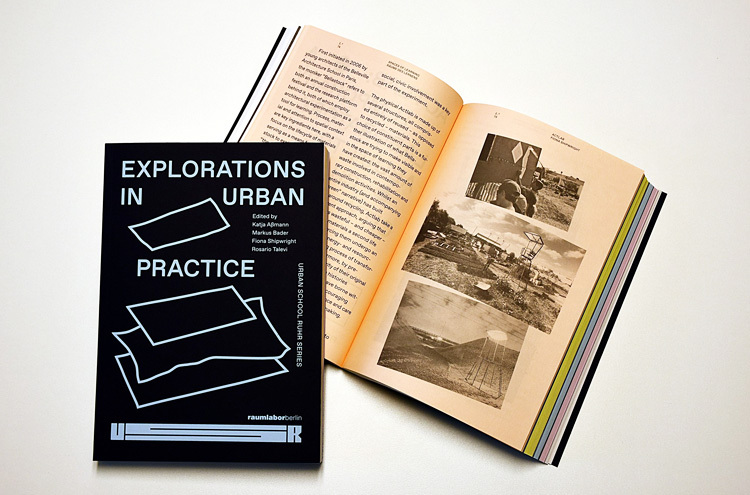 Explorations in Urban Practice, the first edition in the Urban School Ruhr Series, draws from and reflects upon USR’s experiences to date whilst also looking to the future of urban practice in contemporary cities. The book presents the reader with key current questions in the field: how can we learn city making? How should we understand the political concept of commoning for this purpose? And how can we discuss intervention as a strategy for enacting urban change? With contributions from: Juan Chacón, Dirk Baecker, Merve Bedir, Pablo Calderón Salazar, Bianca Elzenbaumer and Fabio Franz, Benjamin Foerster-Baldenius, Silke Helfrich, George Kafka, Valentina Karga, Gilly Karjevsky, Hannes Langguth, Laura Lovatel, Torange Khonsari and Andreas Lang, Marjetica Potrc, Anna Giulia della Puppa, Julia Udall, Sam Vardy, Sabine Zahn. >> Shortlisted for the Cornish Family Prize for Art and Design Publishing at the National Gallery of Victoria, Melbourne. Title: Explorations in Urban Practice. Urban School Ruhr Series.